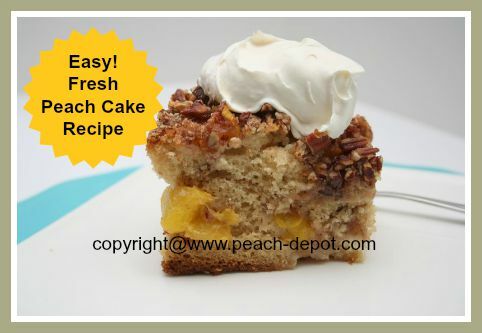 If you are looking for a Fresh Peach Cake Recipe, here is the perfect one! Homemade with fresh peaches and sour cream with a pecan nut topping! I baked this cake today; I came across it in my morning newspaper and altered it slightly. 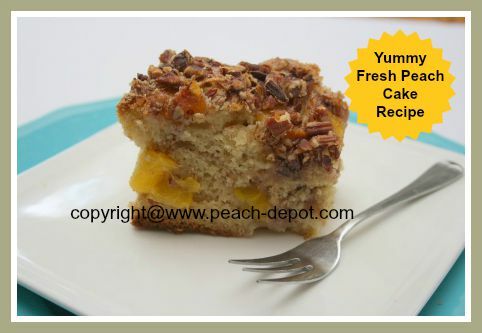 Homemade Peach Coffee Cake ... So Yummy! It's like a peach coffee or tea cake ... scrumptious to the last crumb! In a large bowl, beat the butter with 1 cup of the granulated sugar on medium-high speed until light and fluffy. Add the eggs, one at a time, continuing to mix on low speed. Add the sour cream and vanilla extract and continue to mix until the batter is smooth. In another bowl, whisk together the flour, baking soda, baking powder, salt and 1/2 tsp. of the cinnamon. Slowly add the dry ingredients to the batter and mix on low speed just until combined. Do not over-mix. In a small bowl combine the remaining 1/2 cup of granulated sugar, and the remaining 1/2 tsp. of ground cinnamon. Grease a *9" x 9" baking dish or equivalent. Spread one-half of the batter evenly in the dish. Top with one-half of the prepared peach pieces, then sprinkle with 2/3 of the sugar mixture. Spread the remaining batter on top, arrange the remaining half of the peaches on top, and sprinkle with the remaining sugar mixture and the pecans. Bake at 350° F for about 45-55 minutes, or until a toothpick inserted in the centre comes out clean. Serve warm or at room temperature plain, or with a dollop of whipped cream or ice cream. 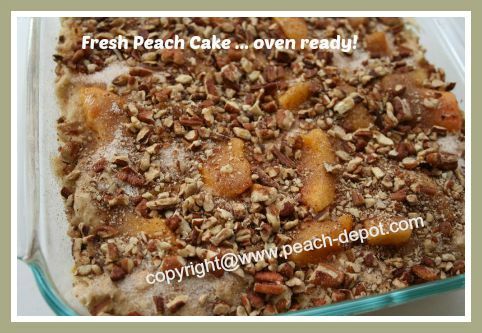 Scrumptiously scrumptious fresh peach cake indeed!